I've been treating A Girl of the Limberlost as a children's book, one for much older children, but a children's book nonetheless. Today I learned that it is considered, at least by the people who manage one of author Gene Stratton-Porter's historic sites (she has two in Indiana), as one of her novels. This puts a totally different spin on the switches to adult point-of-view I was writing about a while back. 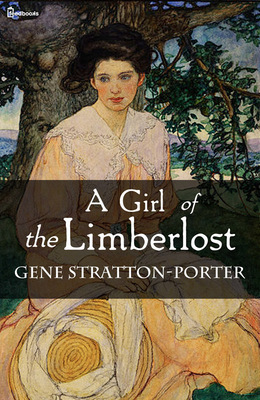 If Limberlost isn't a children's book, why shouldn't we be hearing from the adult characters? Today it's not uncommon to find adult books with child main characters. The Flavia de Luce books are a well-known recent example. I'm reading The Inn at Lake Devine right now, which is an adult book with a child main character. * While I'm sure that teenage Elnora Comstock is considered the main character in A Girl of the Limberlost, the point of view switches mean other, adult characters get as much time on stage as she does. At least they have so far. Last year's 2 AM at The Cat's Pajamas does something similar. In that book, there is a child who is one of three characters. Four, if you count the dog. Limberlost was published in 1909, as I've mentioned before. My reading on the history of children's literature is spotty. But there may not have been as big a divide between what adults and children read in days of old. ** I've heard that everyone read Alice in Wonderland, for instance. I don't know what was going on with the "girl" classics of the late nineteenth/early twentieth centuries, such as Rebecca of Sunnybrook Farm and Pollyanna, a book I've read was so popular that there were Pollyanna clubs. Who was it popular with? Children or children and adults? My point being that everyone may have been reading A Girl of the Limberlost. I'm guessing they would have had to for Gene Stratton-Porter to have become as popular and successful as I learned today that she was. *Oops again. Natalie is a child in only the first quarter of the book. **According to the New York Public Library piece How did YA Become YA? by Anne Rouyer, "Back in 1919, there wasn’t any literature being specifically written for teens." So, presumably, there wasn't any in 1909, either.